Buch earned a lucrative opportunity last summer when she attended the Mathematical and Theoretical Biology Institute. Buch presented her research at the Mathematical Association of America’s Joint Math Meetings in Seattle this past January. During the intensive, two-month program, Buch worked with other math students to research and develop mathematical models, equations and analysis techniques to get answers for her case study. Buch and her group members chose to analyze and research the mating behavior of Side-Blotched lizards, which are native to the American Southwest. Buch found that male lizards play a mating game similar to rock, paper, scissors based on throat skin color. Buch said research days lasted 15-18 hours per day. Competition between the groups made the research sessions more intense. Buch was selected among hundreds of applicants to attend the program at ASU. She collaborated with a student from the University of Florida and a student from the University of Los Andes (Colombia). Buch and her group compiled a 20-page technical report and also created a poster to present their research. Buch, a recipient of the Meridian scholarship, plans to continue to pursue research opportunities and to attend more academic conferences in the future. 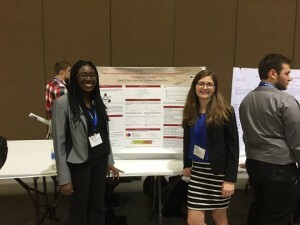 She has already made visits to universities to apply for a PhD program related to biomathematics including the University of Tennessee, North Carolina State and Arizona State.